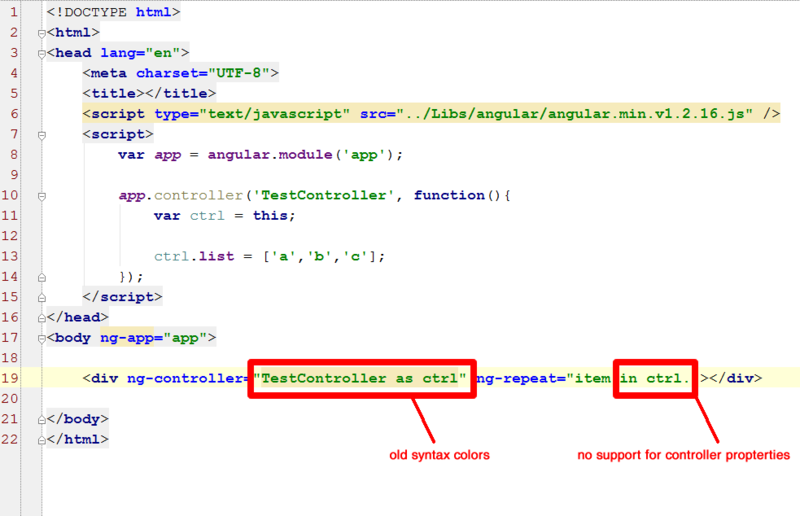 I have just updated webstorm 5 to 8 to get the advanced angular support but I don't get any one of the advanced features described in the videos... expecially code completation in HTML file, when I type the controller's alias I don't see controller properties. But also the code coloring in HTML is still like in webstorm 5 instead of the new one of webstorm 8. Also an other question: I'm used to define controller's properties and methods on controller's $scope. In your videos instead you define them in a controller's alias (var ws = this;). Does the advanced support work with properties and methods in scope like it does to controller alias? Accordingly to the http://blog.jetbrains.com/webstorm/2014/03/angularjs-workflow-in-webstorm/ you should use non-minified version of angularjs. I read the full article but I couldn't notice that.